It's important to note that Blueberry Pomegranate Total contains neither blueberry nor pomegranate. This is a tasty cereal that I'd recommend trying, but don't get suckered into thinking you'll get any direct health benefits from the fruits in the title. Blueberries and pomegranates are kinda-now-kinda-wow fruits because of their high levels of antioxidants. A recent study at the University of California listed pomegranate juice as the beverage with the highest concentration of disease-fighting antioxidants. Blueberry juice was listed at number four. If you're in it for the flavor, pick up a box of this cereal. There's a distinct permeating blueberry flavor. You can occasionally taste pomegranate. But the truth is... if the box didn't say "pomegranate", you be more inclined to describe the flavor as, "Hmmnn... there's another slightly tangy fruit flavor in there that I can't identify." If you're interested in blueberries and pomegranates for their health benefits, make a breakfast of this Blueberry Pomegranate Smoothie instead. If we set aside the idea that Blueberry Pomegranate Total might be considered a little shifty for taking advantage of consumers' interest in popular antioxidant-rich fruits, we're still left with a very nice cereal. The flakes have more of a cornflake shape and consistency when compared to original Total. These flakes have a lot of berry flavor on their own. 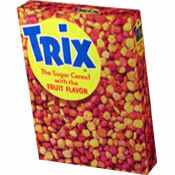 Every second or third bite, you're greeted with a "crunchy fruit flavored cluster"... or as I like to call them, "occasional little treats". While the antioxidants don't come from the exact source you'd expect, this cereal does provide 100% of your daily recommended Vitamin C and Vitamin E, which are both considered antioxidants. Other nutritional considerations: Each 1 cup serving has 170 calories, 2 grams of total fat (0 saturated and 0 trans), 38 grams total carbs, 4 grams dietary fiber, 11 grams sugars and 5 grams protein. 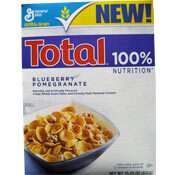 What do you think of Blueberry Pomegranate Total? The FDA should call them on this name. General Mills is betting your a moron and won't read the label, thinking your getting a cereal with Blueberries and Pomegranates in it. I'll never buy it. This is another preposterous example of a food company exploiting a health trend to sell a fundamentally unhealthy processed food, in which is not to be found a trace of the actual whole food it deceptively advertises aside from a man-made chemical that simulates its aroma and flavor. Absolute bunk! I really enjoyed this cereal I am a little concerned with the sugar content but love all the good nutrition in it, tastes too good to be healthy. I have to wonder is it more healthy than fattening? I don't even know how it got a 5 out of 7.... I really wanted to like it, and I was really excited about it - but its bland... no way around it. Too sugary, if it had 7-8g sugar per serving it would be a lot better. Currently inedible. I loved the Blueberry flavor, and the smell was absolutely wonderful. I tie this in with my exercise program and my water drinking and fish oils. I love blueberries and pomegranate, but when I opened the box, the aroma was so... chemical that it put me off. It didn't taste bad, but it didn't taste good, either, and it smelled more like a blueberry pomegranate body spray than a cereal.